With an offer like that why not plan to archive all of the old documents you no longer need to hand? Archive storage should be a part of your everyday business. 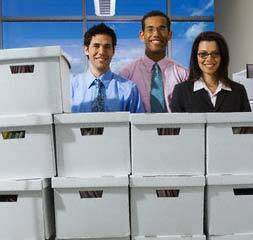 There will always be the need for you to store copies of your documents but having rows and rows of filing cabinets is not the way forward. By archive storing your documents at DataSpace UK’s location you will save space. Why not clear out all those old filing cabinets, order some boxes from us and free up some space? Consider what you could do with all that extra space! Archive storage means that your data and documents are no longer on your site. If there is a fire or a theft, your documents remain safe and sound. In fact, our archive storage facility has 24/7 security surveillance as well as fire security. Overall, archive storage becomes a much more cost efficient way of working. You can organise your office electronically and you no longer need to search for documents. Simply call us up and we will find them for you and return them within the hour. It could also mean that with all that extra space you no longer need such a large office! Why not order your archive storage boxes today? And get organised. You will feel better for it and could save time, money and even space.